NASCAR and the south go hand-in-hand just as much as RVing and NASCAR go together like peanut butter and jelly. RVing to NASCAR events and races has long been a standard in the RVing community since the early NASCAR days and it’s definitely something you should try out. If you’re looking for a good old fashioned NASCAR southern track to RV to, you have it in Atlanta Motor Speedway. 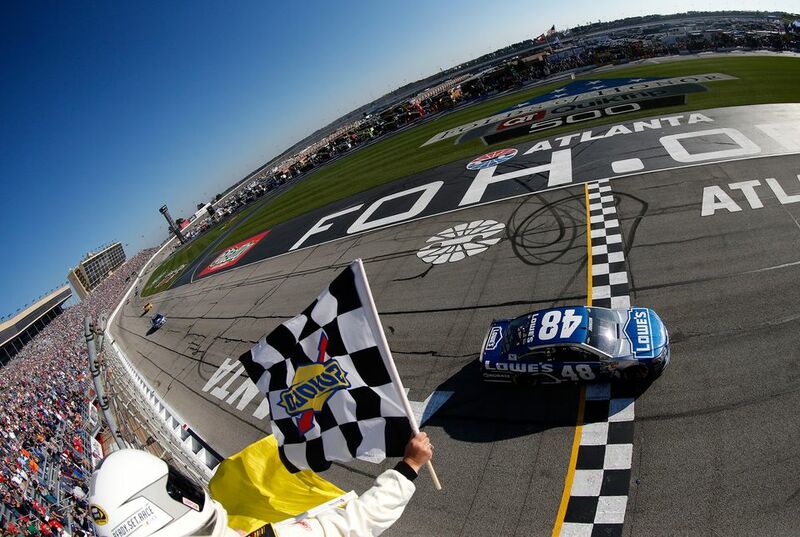 Let’s take a look at what RVing to Atlanta Motor Speedway is like including ways to stay on the track, nearby the track, as well as tips and tricks to make your trip easier. Let’s get it going in the Peach State. Atlanta Motor Speedway has been in the NASCAR family for several decades. Opened in 1960, the track was originally 1.54-mile standard oval track until 1997 when to standardize the track, the circuit was transformed into a quad oval track that now sees some of the fastest speeds in the entire NASCAR circuit. Atlanta Motor Speedway currently hosts several NASCAR sanctioned events including an annual NASCAR Sprint Cup Series Race. Like many of the NASCAR tracks there a multitude of ways to RV at Atlanta Motor Speedway. 19 individual campground sites in total, many of which you can keep your RV at. Unfortunately, there are too many site types to list them all but here’s an example of RV site types. The sites are varied with unique specializations like family oriented campgrounds with strict quiet time hours or unreserved sites for last minute RVers. For a full list of camping options, visit Atlanta Motor Speedway’s camping page. For some RVing directly to the track is the only way to go but for others may prefer a nearby RV park with more amenities, here are a couple of our favorites. Located approximately a half hour from Atlanta Motor Speedway, High Falls State Park is a great option for RVers who prefer public parks with outdoor action nearby. You have water and electric hookups and while you won’t get sewer right at your campsite, there is a dump station within the campground. There are several other great amenities such as showers, restrooms, laundry, playgrounds, trails and more. A peaceful respite from the roar of NASCAR engines. Stone Mountain Park is a little bit further from the track but still less than an hour away and a great RV park if you plan on exploring the Atlanta area. There are several RV site types available but most of them come with full utility hookups. You’ll get great amenities and facilities such as clean showers, laundry facilities and grill and picnic areas. You’ll also get some fun features for the whole family like playgrounds, swimming pools, hiking trails, live entertainment and much more. If you’re looking for a full-service park for a NASCAR/Atlanta adventure, you can’t go wrong with Stone Mountain Park. Atlanta traffic can be hectic, make sure to provide plenty of buffer time during your trips. Atlanta can be hot even during early spring, make sure to stay properly hydrated for a good time. Plan your route ahead of time so you get to the right area of the track. Make sure any purses or coolers meet regulations before trying to the get inside the track. There are over 800 acres of parking around Atlanta Motor Speedway with shuttle service. There aren’t that many things in this world comparable to RVing to a NASCAR race, especially in the south. Let’s see you get down to Atlanta Motor Speedway soon for a good old-fashioned high-octane race.